Girl Scout Cookie Crunch Event This Weekend! Looking for something to do this weekend? Check out the 2nd Annual Girl Scout Cookie Crunch this Sunday, February 28th from 1-3pm at the ArtsQuest Center at Steelstacks in Bethlehem! In this creative food-based event chefs and restaurants create delicious and unique dishes, be they sweet or savory, all of them made with Girl Scout Cookies. 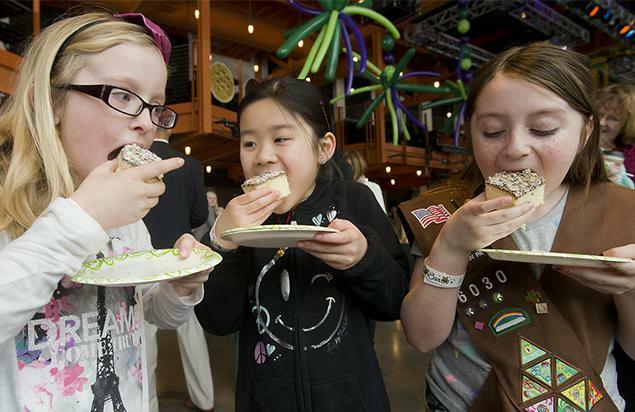 At Girl Scout Cookie Crunch, held on National Girl Scout Cookie Weekend, attendees will enjoy a variety of offerings created by area restaurants and eateries. From amazing appetizers to decadent desserts, each will feature one (or more) of the nine Girl Scout Cookie brands. Attendees can also vote for their favorite Cookie-based dish, with awards given out in both the sweet and savory People’s Choice categories. Tickets cost $30 ($25 for ArtsQuest members and $21 for Girl Scouts under age 17 with ID). Ticket sales benefit Girls Scouts of Eastern PA and the ArtsQuest Center.